Through the centuries, how many such rosy-fingered dawns generated awe, while serving as the origin of the name –– Vermilion –– given these lakes many mornings ago. The darkness, pursued by the light, peals away to reveal nature’s unceasing cadence. The landscape, a once vibrant flood plain, gradually accepts the inevitable. By what are you pursued? Are you most frightened by your darkness or by your light? Vermilion Lakes, slowly dying, lie just west of Banff. At their full 10,000 years ago, they are now slowly vanishing, unsupported by the lack of run–off from the adjacent cliffs. In the blink of a geological eye, their remnants will transform into a mature spruce forest. Does their dying make Vermilion Lakes more attractive? Does our dying make us more alive? As these lakes gradually lose their ability to reflect the present, their past stands as a testament to years of life-giving service. A portion of the third Vermilion Lake, warmed by an underground hot spring, never freezes. 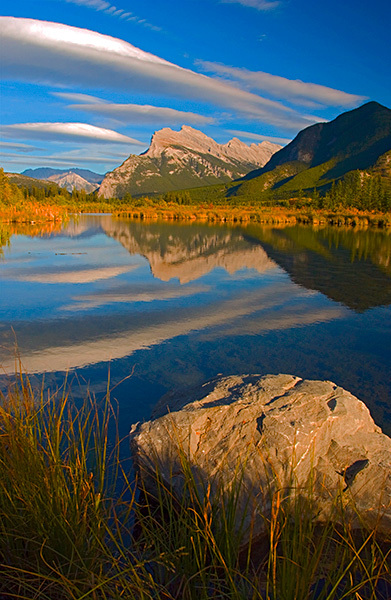 Drawn by the promise of both food and water, the first visitors witnessed Mount Rundle’s reflection lying before them 100 lifetimes ago. A similar reflection rests on the surface some 108 centuries later. Is Mount Rundle older than the rock resting in the foreground? Distance distorts size as time distorts change. How different do these mountains appear some 11,000 years later? What if we were 100 lifetimes younger? As the lakes gradually recede, the earth fills the void. Singular, naked stumps mirrored in the waning water stand silent guard. The marsh grasses, briefly highlighted by the golden rays of the morning sun, steadily displace the lake’s surface. The juxtaposition of shape and color, size and texture, earth and sky frame this landscape –– an embodiment of the endless environmental evolution. We persistently pursue permanence in a world of (ceaseless) relentless change. Why? Vermilion Lakes’ transformation, defined by remnants both of ancient decay and eternal rebirth, is frozen for a moment in time by the shutter. As my camera continues to capture each image, silence prevails save for one unnatural jarring sound. From just beyond the farthest lake floats the mournful, solitary whistle of an early morning freight steadily crawling up the belly of the Bow Valley augmenting this scene of quiet, commanding beauty. Which is more precious, a fleeting moment of beauty or a lifetime of calculated heartbeats? Will a remnant of us exist 100 lifetimes from now?